One of the most common questions we are asked is, “When will RootsMagic run on a Mac?” With today’s release of MacBridge for RootsMagic 6, the answer is “right now”. MacBridge for RootsMagic 6 allows you easily install and run RootsMagic on your Mac in mere minutes with almost no additional setup or configuration. 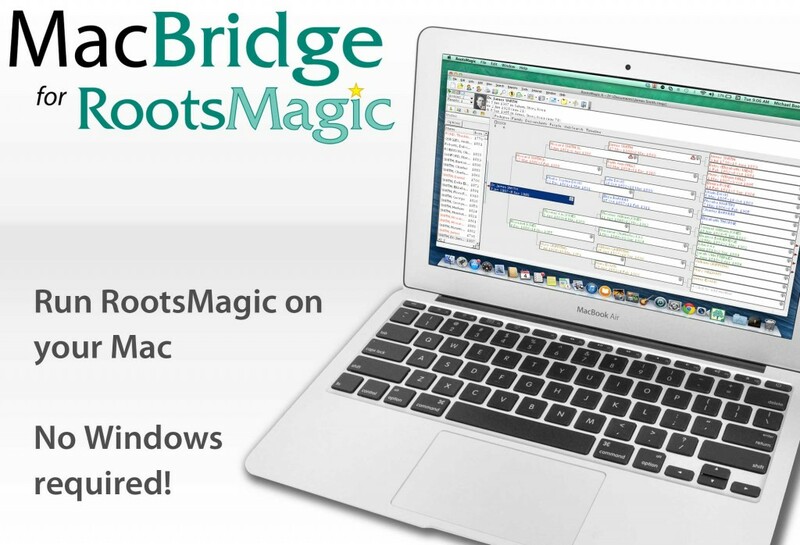 Currently, MacBridge for RootsMagic 6 is available only as a download. The regular price is $14.95 but for a limited time, you can get it for only $9.95. So if you or someone you know uses a Mac and has felt left out of the RootsMagic magic, do yourself (or them) a favor and check out MacBridge for RootsMagic today! Thank you! I tried running RootsMagic in VMWare and found it so slow and crash-prone as to be unworkable. So I have been reluctantly setting up my family file on a Windows laptop, even though all my documents are on my Mac. As soon as I read this post I bought MacBridge, installed it, and copied my file over from the Windows machine. Works great! The only (very minor) problem was choosing a display font that looked reasonable on my non-Retina MacBook Pro; the common sans serif fonts were too light in regular weight, and too heavy in bold. Finally settled on Calibri 14-pt regular. I’m still eagerly awaiting a native Mac version — but MacBridge seems to be a great interim solution. Yea! I am looking forward to installing RootsMagic on my Mac. Thank you!! I have roots magic 6 on my windows computer. I am going to buy a new mac computer. Can I install mac 6 using my present roots magic 6 for windows, or will I have to purchase a new roots magic 6 for mac? Reply: MacBridge for RootsMagic 6 will install RootsMagic Essential 6 with it. You can then use your current RootsMagic 6 license key to unlock the full version of the program. Regarding Mac Bridge, I am very happy about this new development. I have also been told by one of the support people that the actual Mac version will be released some time next year. Great! I have been asking about it for 4 or 5 years now (ever since I got my Mac and moved away from Windows). I believe that it has taken an inordinately long time for you to come up with the Mac version and has been most irritating not to mention the small fortune we Mac users have had to fork out by buying one version of Fusion after another. I just had to buy Fusion 6, not to mention the Windows software nor the frustrations of using Windows within Mac and all of its consequences. Finally, I would respectfully suggest you offer us users of Mac an extra special consideration on Mac Bridge AND on the version to come, for our loyalty to RM by sticking to it through the thick and thin we have all, literally, gone through. I think that would be most fair. Excellent use of Wine, thanks! I’m so excited about this, the web searches and links work, I could not get them to work in Crossfire. Although I am very grateful to Crossfire in getting RootsMagic to work on my MAC I’m really grateful to everyone at RootsMagic in producing this program. You never know how much we rely on something until it doesn’t work any longer. Thank you again for making this program even better. I can not wait for a full MAC version to be available. Well, I welcome this development and any future native Mac version of RootsMagic. Unlike some others, however, who seem to just want to crank about things, I am very happy using Roots Magic and all its features – what a wonderful program!! I reluctantly made the switch from TMG a number of years ago, but was immediately impressed with RM. 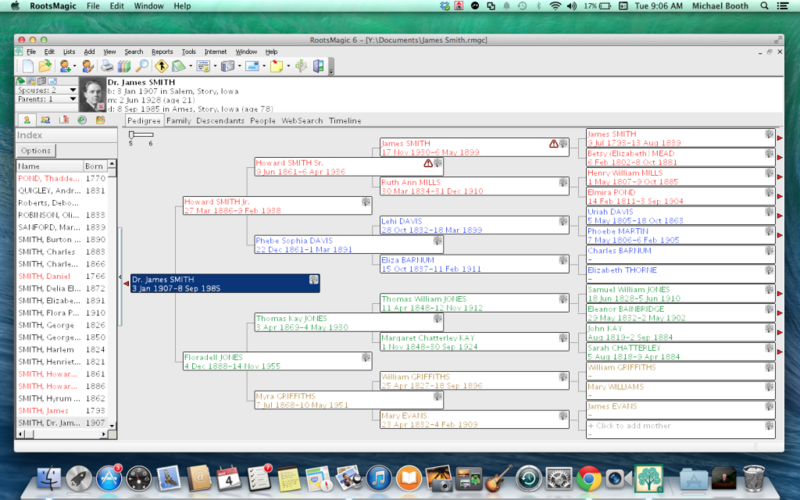 I loved the program so much, that I happily continued to upgrade Parallels on my Mac, so that I could keep using it. No cranking; no asking for special favours; just a happy customer. Just purchased and downloaded the MacBridge and am so excited to start using it! Can’t wait for the native MAC version though. Thanks for this interim solution! After a somewhat rocky start with MacBridge, I’m really enjoying it. When I first launched it, odd things happened. I quit, restarted, and it has been great! Love having it available without having to open VMWare and wait for Windows to load.